Lismore is positively STUNNING! Thanks for taking the time to do the video of your alternative approach too – those videos are really helpful. I’m in love with Lismore already, it is stunningly beautiful as is your Kay’s Diamonds & Purls shawl. I appreciate your corrugated ribbing helpful hint & video as I have some Fair Isle sweaters in my future. I love the Lismore! Gorgeous! 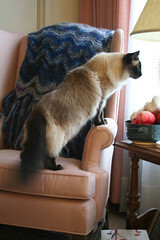 Gorgeous kitty must be watching a bird, window cleaner, cloud formations, etc. Another thumbs up for the Lismore and, of course, a paws up to Lucy. If I was a quicker lace knitter, I’d be all over the test knitting. I’ve got four lace project scheduled for this year, so maybe by next year I’ll have picked up some speed. So I hear you about the corrugated ribbing, and NEAT video; I think it’s very helpful AND a great idea to get around…haha get around! I have so many projects on the go at one time that to switch techniques would mess up my tension mid project. How’s that for an excuse? So, yea, you knit weird, but you also knit BEAUTIFULLY! Looking forward to more photos and videos. Any more books in the works? Oh! Such a clever way to do corrugated ribbing. Thanks for sharing that! Well, if you’re going to go through all that trouble to do the corrugated knitting, it had better look at least that pretty at the end. I’d do it, but I wouldn’t like the process very much, no matter how I had to knit it. 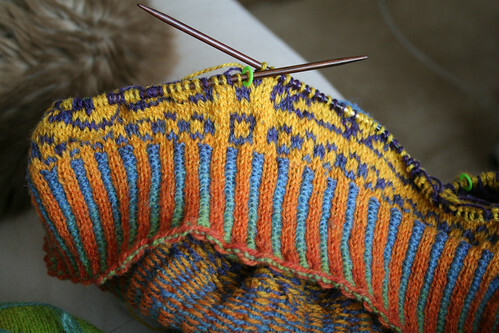 The colors you’re using are so vibrant that I love the look of the finished ribbing. Wow, that sweater is going to be stunning. I don’t think I’ve seen you make very many things quite that bright and colorful before — it’s downright psychedelic! Thanks for the tips about the foam blocks. I think that might go over better with my boyfriend, as we live in a tiny apartment and those can be moved out of the way a bit. However, the link in the previous post (where you reference the post from the previous Tuesday) doesn’t go to anything. Where can I find those blocks? I also love the new sweater! I figured I would like it based on the colorway. I simply adore rainbow patterns. And I love the pattern! I’m LOVING that Lismore sweater! 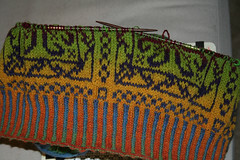 I just may have to give this fairisle a shot! Have to ask….Is that your voice in the video? If so, it so doesn’t fit the voice I have in my head when I read your blog! Crazy! Don’t you just LOVE the Kauni yarn?!? I’m doing a variation of the Ruth Sorenson sweater (with X’s and hearts instead of rectangles…cause I’m huggy like that) and have had such a wonderful time watching the colors change! I’m sure you’ll enjoy it, too! I’ve always avoided corrugated ribbing, as I thought–no, knew–that knitting it would be a PITA. I watched your little film, and that looks like an awesome way to do it. I’ll be filing that away in the memory banks for future reference. Very cool. TFS! Squeeeeee! I love when you post video of yourself knitting! I am totally fascinated and I called my husband and sons and made them watch too. They said, “Uh-huh,” and wandered away. They know nothing about cool knitting techniques, poor guys. Thanks for the video. The sweater looks great! That sweater is just remarkable. Thanks for the video. I’ve never seen corrugated ribbing before (or at least didn’t know that I was seeing it), so it’s doubly interesting to me. I love the Lismore, what a great use for the Kauni I have to agree with you about corrugated ribbing. I am stuck in the middle of some. I might try it your way. Thanks for the hint. I’ve never done corrugated ribbing (I’d have scratched my eyes out first! I hate k2p2 ribbing as is!) 😉 but that’s an awfully neat trick and now I might have to try it! How are you getting so much of that dark blue background color on Lismore? Have you been cutting the yarn? I just love that sweater. I would test-knit in whatever weight. I have plenty of lace yarn for a smaller laceweight, but I’d do whatever. A cup of espresso and Wendy demonstrating corrugated ribbing. What a wonderful way to start the day! Wendy, that is brilliant! I do have a stupid question…slipping like that, seems like it may take out the fear of the ribbed edge stretch, that has caused many knitter to search for the wine bottle. Am I to hopeful? I would love to offer my services for test knitter if you ever feel the need to make sure it is totally idiot proof. That is my specialty, ya know. FAB corrugated rib technique! I will definitely be giving that a go (probably on mittens, though, not a sweater). Lucy looks so regal on her wing chair, monarch of all she surveys through the window. 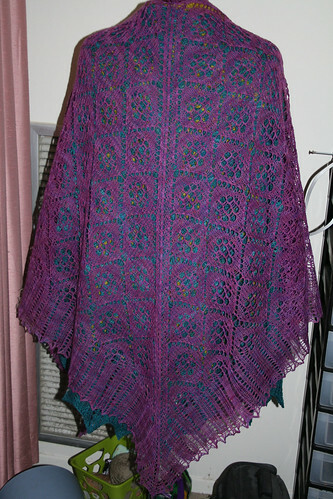 The shawl is breathtaking–can’t wait to see it on a real human being. No offence to Gwendolyn. I totally feel for you on the ribbing. I’m working on Donegal by Starmore and the ribbing almost sunk the project for me, and it seems like every one of the sweaters from the Celtic Collection is like that. 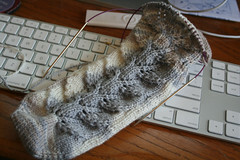 I have to admit that after the ribbing, I knit about 6 rows and then ran away and started working on lace. 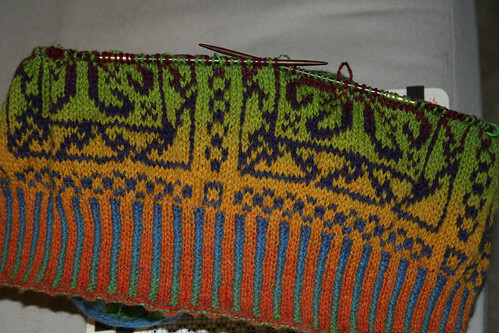 I’m almost done with the Kiri shawl now, so I’ll probably hop back on with knitting Donegal again in this next week. Really like your color choice for the sweater! I am so pleased to see that your new project is a sweater. I have not been bitten by the sock-madness, and have missed seeing you create the wonderful AS sweaters. Good tip in the ribbing! thanks! You are such a prolific knitter….I , too work full time and am lucky to get in two hours of knitting in the evenings. Even with your opportunity to knit during your commute I don’t understand how you manage to get so much done on your projects in a single day. Are you super fast or do you just not sleep?? I can’t wait to see how Lismore turns out. I also have some Kauni yarn, but I didn’t want to join the cult of little squares! I’m so jealous 🙂 That is a GORGEOUS piece of work already… inspirational even. I can’t wait to see how it finishes up. I love the idea of knitting and slipping when working the corrugated ribbing. It sounds like it would be so much easier. I also love the gradual change of color with your yarn. Beautiful. Thanks so much for posting the video of corrugated ribbing. I’ve never tried this, and I am about to. It looks so easy when you do it, that I’m hoping it will be for me also. Wendy, you are amazing. It will take me a LOT longer to reach the same point in the sweater as you have already. You are fast. Lismore is looking great. The Kauni is really beautiful here. I appreciate the technique for the corrugated ribbing. Sounds so much easier! Hi Wendy – I comment about once a year (maybe), but I read every blog entry. Everything you knit is exquisite and you’ve been an inspiration to me. Today, the picture of Lismore made me gasp – it’s beauty, combined with the technique you’re using just took my breath away. I think it’s something I might try in future, if I’m ever brave enough. Thanks for blogging! WOW. Wow wow wow wow wow. I initially had my doubts about the Kauni Lismore, but I take it all back: that is STUNNING. I love it! I completely love working corrugated ribbing — but I knit Continental, with both yarns in the left hand for colorwork, and I use Norwegian purling to do the purling for it. The Norwegian purl is a seriously fun stitch, all swoopy and intricate, so I actually relish the case where it really makes sense to use it. I can;’t believe how much knitting you get done and work full time, a mystery; and I loved starting my day with your video, how sweet is that? and watching you knit so unusual, and so beautiful to watch, even more puzzling how you get so much knitting in. Great tutorial and thanks so much. i love the look of the yarn with your pattern (peace socks) it looks like the color flows so nicely, i love your blog. I like the way the colors in the new sock seem to be highlighting the cable/pattern. Of course, try to get that to happen on purpose. And the sweater is lovely. That’s the first time I’ve ever seen you knit, Wendy. I remember you writing at some point that the way you hold your needles and yarn was “different”. So now I know. I’ve seen the knit/slip//purl/slip done also for patterns having 3 yarn colors on each row. I’ve also seen where a facing is knit first, then the hem done all in knit (no ribbing!) and then the facing and hem knit together on the first body row. Lismore’s colors are great–they definitely pop out on the screen! Wendy, thanks for the idea for a different way of doing the ribbing. I also read about this idea of slipping for Dale patterns with three colors in a row? Was that in your blog–senior moment, I can’t remember. In any case, I think this way of doing the two color ribbing is much more effecient. Thanks! LOVE the video! Will file that technique for the day I finally get my nerve to try colorwork. (No, it probably won’t be this year…too much else on my queue, boohoo!) Your voice is pitched lower than I “heard it” in my mind’s ear! The shawl is gorgeous, and the photo of Lucy in the chair? Well, not only is the gal gorgeous (I know, we knew that), but so is the throw! The sweater is beautiful. You are so good! I’m sure Lucy is a big help! That’s a great idea for the corrugated ribbing. I’ve never really wrapped my mind around how to do it (I’ll further admit that I haven’t really tried), so it is great to see an alternative using skills I know I already have. Yours is a fascinating take on corrugated ribbing. Looks like more fun than the other way. What tension did you use for the carried yarn? How stretchy is the final result? The corrugated ribbing I’ve done in the past wasn’t very stretchy. Oh sure! I just finished a sweater with 6inches of corrugated ribbing and 4 inches on the bottom hem of a skirt. (I have 2 inches left to corrugate on the waist band). A tad monotonous and wrist breaking. I’ll give your trick a try! I am truly becoming envious of your 2 hour (if I recall correctly) commute!! Since I’ve started working full time in the office as the AM dispatcher I am getting very little actual knitting done. Getting up at 4:30, working 10 hours or so, coming home and performing the minimum amount of work required to still qualify as a mother and getting to be by 9 to get my 7 hours of sleep (I think that I’m missing out on the magically 8th hour which is probably the “beauty” part of beauty sleep) leaves about 1 actual hour for knitting. I guess that’s what is referred to as “quality time”!!! LOL I certainly am making the most of weekends and while I’m enjoying the work I am equally looking forward to it being over. As I am knitting the continental way I just want to tell you how I do corrugated ribbing. I take the thread for purling on my left hand and I take the other thread loosely along the back side of the knitting in my left palm, so I can just take it up for knitting it through as often as is necessary. BY the way, I do all my fair isle work this way: the pattern colour on the hand and the background colour stringed along loosely in the palm. And in some kinds of colour work where there is a third thread I let it hang down to the right and take it over to the left just for knitting it through when it has its turn, but taking care about a smooth tension of course. Best wishes, especially to Lucy!